An imposing yellow, red and grey stone building on the square of the same name in Moscow – and once probably the most feared building anywhere. 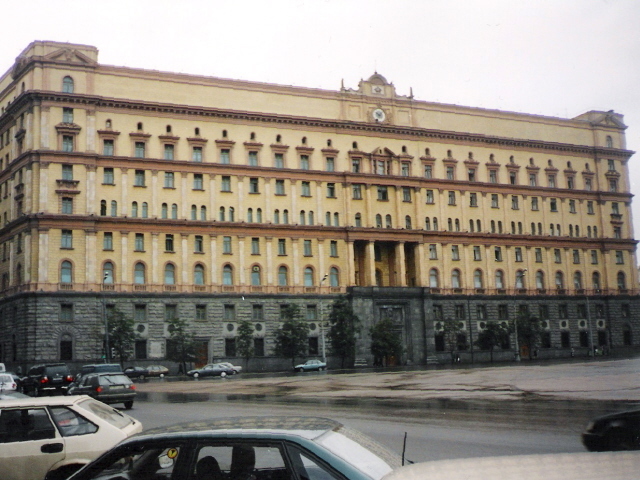 It used to be the HQ for the infamous KGB, and included a prison. In Soviet days ordinary people didn't even dare look at the building, such a dark aura was emanating from it. Today, the KGB has been replaced (at least in name) by the FSB, which continues to occupy the premises. There's a small museum about the KGB at the Lubyanka – but it's not open to the general public. Some tour operatorsused to offer specially arranged tours of this until not that long ago. But when I enquired with some of them ahead of my 2017 summer trip to Russia they all replied that it was no longer possible. From what I read I gathered that the museum has old spying equipment, documents, old propaganda, etc. on display – and some James-Bond-like Cold War paraphernalia. Shame you can no longer see any of this. Outside on the wall are some typical Soviet ornamentations, as well as a few plaques, including one for Yuri Andropov, who had been the head of the KGB for many years before becoming General Secretary of the Communist Party (i.e. the USSR's leader) after the death of Brezhnev, who had ruled the state for 18 years. Andropov was less fortunate. He died after only 15 months in office. Across the square, on its southern side, is a monument to the victims of political repression, incorporating a Solovetsky Stone (from the island of that name in the White Sea where one of the first gulag camps for political prisoners was set up in the early Soviet era – see also Museum of Political History, St Petersburg). At the time of my visit in August 2017, the monument was in a sorry state, with brown withered flowers lying around – that's because it was inaccessible at the time, due to major reconstruction works on the square. The photo below was taken through a gap in the fence around the site. 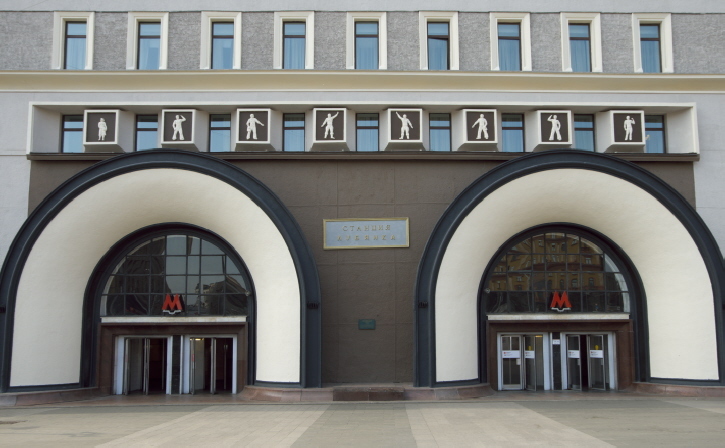 The entrance to the Lubyanka metro station on the western side of the square is also worth a look for its exaggerated arches and socialist-realist reliefs. Location: on the north-eastern side of the square of the same name in central Moscow, Russia.